Last Thursday was my sister's 21st birthday. It was a given that I was going to make the cake. I told her with a week to go to have a think about what sort of cake she wanted. She had no idea. It's harder to think of ideas when you're not a baker – you're much less aware of the possibilities. A few days out I became resigned to having to work it out myself. Almost as soon as I came to this resolution, she piped up with, "I know what I want! A chocolate ripple cake!" ". . . really?" I replied. My heart sunk a little. I'd been looking forward to the opportunity to create something whimsical, test some new skills, have some license to create. Of all the things I could make, she chose the easiest cake in the entire world. For those of you who don't know, a chocolate ripple cake is simply biscuits sandwiched with cream. Left to chill in the fridge, the biscuits absorb the moisture and become cake-like. Some countries refer to these as a zebra or an icebox cake. 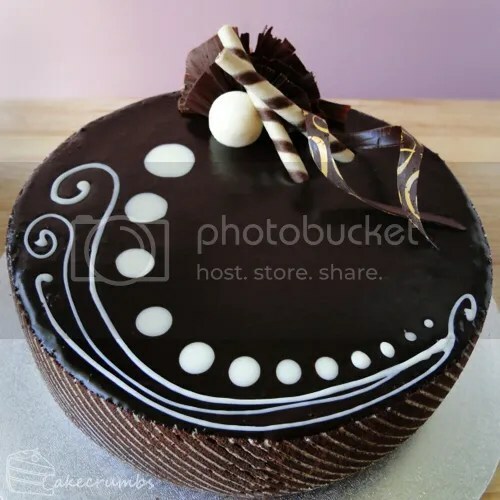 Here in Australia, we call it chocolate ripple because chocolate ripple is the name of the biscuit usually used for these cakes. The biscuits are usualy stacked end-on-end to make a log cake. Four years ago, for my sister's birthday, I came up with the idea of making a circular cake out of it and covering it with ganache. It was my first attempt at cake decorating. I've learnt a lot in 4 years, so it was time to put it to the test. Once I settled on the idea, it wasn't long before the creative cogs started to turn and my brain was flooded with ideas. I made the circular choc peppermint cake, as requested, in my usual fashion. I created a joconde imprime exterior for the cake. Between the joconde and the chocolate ripple cake is a layer of dark chocolate mousse. I would usually make mousse for my sister using milk chocolate, as she's a total sweet tooth. But I was worried about the cake becoming overly sweet, so I made efforts to dull the sweetness where possible. Before the chocolate ganache had set, I quickly whipped up a little white chocolate ganache and piped some swirls and dots. My swirls could definitely have been a bit neater. Once it had set I added some chocolate garnishes, as well as some corinthian wafers and a white chooclate truffle. The entire aesthetic for the cake was something I made up as I was going. It looks a lot more cohesive than I thought it might, as I tend to be a bit of a train wreck when I don't have a game plan. This was my first time trying chocolate ruffles, and boy do I need practise. I had to try so many times to get some that worked, so I didn't bother tempering the chocolate. As a result, the choclate is not as pretty in colour as it otherwise could have been. We all went out to Azurea's for dinner and I brought the cake along to show my sister who'd not yet seen it. She nearly died of glee. After oogling, she gave it to a waitress to put in the fridge, who asked her, "Where did you buy that from?" She replied proudly, "My sister made it!" Lovely little flattering moment for myself. Azurea's is a cafe/restaurant that has some amazingly gorgeous cakes for sale, so for the staff there to be impressed by mine was really lovely. Sister cutting through the cake whille my dad watches on, skeptical of sister's ability with a knife. And with good reason. This is definitely one of my favourite cakes in the history of cake ever. My concern that it would be too sweet were culled the second I tasted it. I think this owed partially to the switch to dark chocolate, and partially to the peppermint throught the ripple cake. It was a lot better balanced than I could have hoped for. Even the joconde turned out much better than my first attempt. It was lighter and much more flexible. This one is definitely on the to-repeat list. The family is such huge fans of chocolate ripple cake that this was bound to disappear quickly, but the addition of mousse and ganache saw this disappear at lightning speed. But wait, there's more! If you guys haven't died of a chocolate overdose yet, that is. If I've convinced you that you need to try this but you don't have need for an entire cake, there's a mini version! I had some ingredients left over, so I decided to put them in some ramekins. Each ramekin has three biscuits worth of chocolate ripple cake and some mousse. I didn't have heaps of spare ganache, so these don't feature them. It didn't miss the ganache terribly, but you can add it if you like. Depending on how many you want, you could use 1/2 or even 1/4 of the below recipe. They make a very quick and lovely dessert. For the chocolate ripple cake and ganache I always eye ball it, so I don't have an exact recipe. Below is a rough approximation of what I do, but there's room for movement. This recipe looks intimidating in length, and it is definitely the longest recipe I've ever written, but the process doesn't take all that long (I've spent longer baking bread than making this cake). To pattern the décor paste you can use a variety of different methods. I’ve written step-by-step tips over on this entry. Combine all ingredients except the biscuits in a bowl. Whip the cream to soft peaks. Repeat until the cake is as tall as you desire (mine was about 5-6cm), then cover the entire 'cake' with a thin layer of cream. In a separate bowl, sift almond flour, icing sugar and cake flour together. Gradually beat in reserved egg yolks. If mixture appears too loose, beat in an extra whole egg. Remove from oven and cool slightly. Invert cake onto baking paper (so your pattern is facing upwards) that has been dusted with cornflour or icing sugar; remove silicon mat. Once completely cool, cut away burnt/dry edges. Measure the height of your chocolate ripple cake, then cut the joconde into strips approximately 1cm taller. Use a circular mould that is larger than your ripple cake. I used a springform tin (without the base). Place the mould around the ripple cake so that the cake is centered. Line the mould if desired [I didn't bother]. Take you strips of joconde imprime and place them, pattern side facing out, around the mould. Ensure your imprime is packed in tightly and won't shift. Pour the mousse over the cake, making sure to work the mousse into any gaps. Ensuring that your mould won't move, you can gently tap the cake on your bench to get the mousse to fall into all the little nooks and crannies. Chill cake in the fridge for a minimum of 6 hours. Overnight is preferred. The longer this cake sits, the nicer (and more cake-like) it becomes. Heat the cream in a small saucepan until just boiling. Pour this over the dark chocolate and stir until chocolate has melted. Stir in butter. Pour the ganache little by little over the top of your cake, making sure it spreads to the edges. Be careful not to pour so much that it will spill over the edges of your cake. But I think I’ll start with trying a simple chocolate ripple. I’ve never done sth like this before. Tasted pretty amazeballs. I forgot how much I love ripple cake. I should make it more often. be seeking loaded, people can discover you numerous if you gently put your overall handbag along when you. I want to ask, how big was your “cake board” and how big was the springform that you used? 😉 I’m planning to try to make this cake for my friends birthday, and this cake seemed perfect since he said he wanted a chocolate cake!